I’ve been remiss. It’s been four weeks since my last post. It’s not that I’ve abandoned my blog – not at all – I’ve just been a busy, bad blogger. I guess I did need a break and my hair wasn’t a priority over the last little bit. I needed to get back to myself. I went on a trip to have a “restoration” as my pastor calls it. I needed to re-energize. It had been a pretty crazy year – from April 2010 to present, I’ve felt like I’ve been going ALL THE TIME. So, I just got back from a holiday (a Friday Favourite thing is coming about that!) 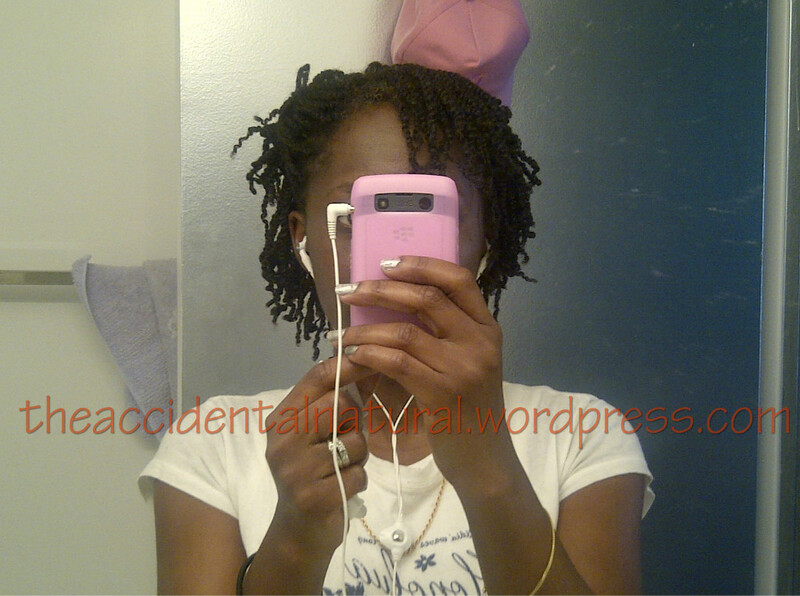 and I decided to do mini-twists. Now, the twists weren’t as mini as I would have liked them to be. A friend mentioned that if my hair is prone to knots or tangling, I may want to make my twists a little bigger. So, that’s what I did. 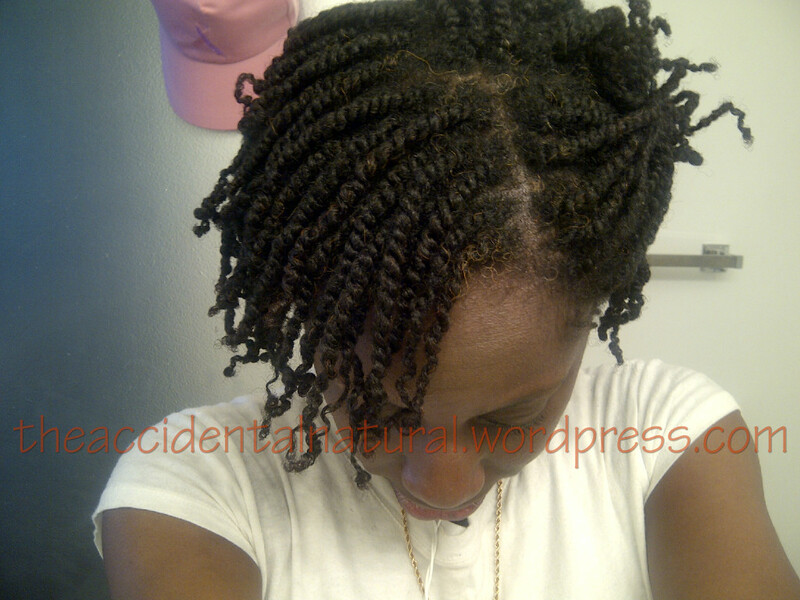 They were still the smallest twists that I ever did, they weren’t as tiny as some of the ones I saw online. I washed my hair Tuesday night with my Henna Sooq Berhempsu shampoo bar and massaged my scalp with my Head & Shoulders Classic Clean conditioner and used my modified Kimmaytube leave-in mix. I sealed with shea butter and put my hair in maybe eight rough braids. After work on Wednesday evening, I sat down with my Essential Wholesale Styling Hair Jelly, shea butter and my rosewater and aloe vera juice spritz and twisted the front portion of my hair. I had divided my hair in three sections: front, middle and back. I really thought that it was going to take me three days to do my entire head, but I got through it pretty quickly. By Thursday at 3:30 pm I was done. I am thoroughly enjoying having a smartphone. Excuse my greys, please. Henna can only do so much. I was very impressed with my workmanship. I’ve been moisturizing with shower steam and shea butter – which was fine when I was in the steamy, wet Caribbean. Back home, it wasn’t working out so well. Today, I decided to moisturize with glycerin, shower steam and shea butter. It’s working out much better. And, my scalp is behaving like a champ. It’s been two weeks without a wash and there are no flakes or problems. I want to wash it – I hate the thought of going longer than two weeks without washing my scalp and hair, but I’m trying to hold onto this style for at least a couple of weeks. I’m convinced if I wet my hair it will knot and tangle. That’s not what I’m looking for. I love it looks great. So you have to tell me more about Rose Water and Aloe Vera Juice I haven’t read about the benefits of that combo. But your hair texture looks like mine and I love a tip. I’m new to the natural lifestyle.